Collecting a debt in Dominican Republic can seem impossible. Language and cultural barriers, foreign laws and customs, and sheer distance all impose serious challenges. Debt recovery is simpler when you use a collection agency fluent in the laws and customs of the country where the debtor resides. Cedar Financial offers on-the-ground representatives in Dominican Republic who understand the debt collection practices that work to support full recovery of your funds. With offices in over 150 countries, including Dominican Republic, working with Cedar Financial provides you access to a global network of nationally licensed debt collectors. Our in-depth understanding of local laws, customs and cultures guarantees the best possible debt mediation results. 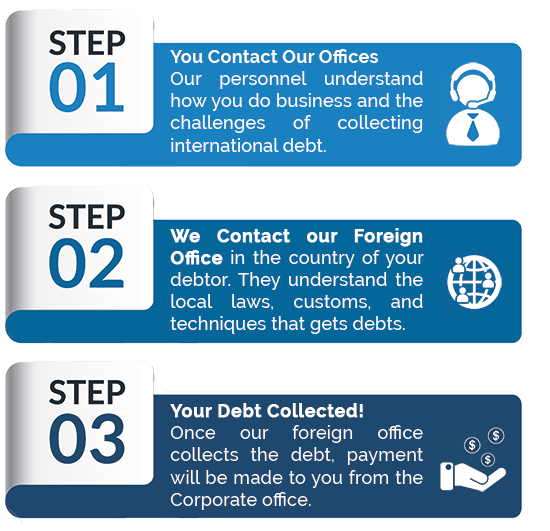 Why should we ask you to collect our debts in Dominican Republic? We are the professional collections business of the Dominican Republic, with full-time dedication to the business. As professional agency of the management of collections with more than 16 years of experience, we are organized on the base of ethical, transparency and respect values for its clients as for the debtors. Our debt collection work is carried out on a “No Collection No Fee” basis, so we do not charge our client until we collect the debt, and because of that we share our client’s risk. The minimum amount we accept is $1,000.00 for a one-time placement. We service any type of debts, provided that it has supporting documents. Our amicable (non-legal) debt collection process takes at the most 6 months. After that period, we may recommend other actions or closing the file as unrecoverable. Upon receipt of the case and depending on the contact details provided, we initiate collection (call, fax, email, registered post) or do a search to trace the debtor. In some cases, and where necessary, we pay personal visits, free of charge. In the Dominican Republic, the normal period for the collection of debts is 20 years, per the provisions of Article 2262 of the Civil Code of the Dominican Republic. However, there are numerous abbreviated statutes of limitations, which depend on the nature of the debt involved. Yes, we do provide this service also. We make site visits, we meet with the debtor and we make asset investigation, skip tracing, etc. Yes, in the Dominican Republic, the supporting documentations is always required. Yes, we do offer litigation services. In fact, we have a vast expertise in judgment and promissory note enforcement. There are additional charges for litigation including court costs which will vary from state to state. All requests for suit are accompanied by a recommendation and a breakdown of legal expenses including taxes. There may be additional fees charged for specialized work. Yes, collection fees are legal to be added to the balance owed by the debtor, however, on certain cases, the debtor should agree with that charge.